It’s Wednesday, or, at least I think it is. The days just seem to melt together when you don’t have a routine or a schedule to follow. Each day seems the same. There is nothing to separate one day from the other. There is no weekend to look forward to. No vacation either. Most people think they want a carefree life. Claiming “I wish I didn’t have to work.” I admit, on occasion, I had these same thoughts. But, when I was forced to take vacations because my accrued hours were capped, I thought differently. These vacations were often unplanned and I merely stayed home. I guess that’s why they call these “staycations.” Usually, I found myself bored out of my mind by the second or third day, trying to find something to occupy myself with. During these periods, I often found myself contemplating how my life would be nothing without a routine. Waking up at a certain time and doing things in the same order made me who I was. I find myself in this exact situation right now. Having an accident caused my life to be changed “big time.” I haven’t worked since the accident and my routine is pretty much nonexistent. I’ve tried to maintain some normalcy, waking up at the same time, eating breakfast, and doing my spiritual work. However, slowly but surely, my routine has flown the coop. At times, I feel completely lost. Therefore, I have been trying to create a new routine. With this decision, I’ve done some research and I have found that a routine is actually very important. Let me share what I have found. I think this is sort of obvious. It’s no doubt that a routine provides a sense of structure and familiarity. Structure is a way of organizing your life so that it makes sense to you. It provides you with organization and order in your life. Basically, having a routine allows you to feel a sense of ownership of your life. Also, structure is important because you no longer need to regularly schedule your days ahead of time. You already know what you are going to be doing each day. Once you are finished with one thing, you already know what is next. The structure of a routine provides direction in your life. It allows you to act instead of being stuck because of a lack of direction. This is called analysis paralysis (not doing anything because you don’t know what to do). Human beings are creatures of habit and actively building a daily routine for ourselves creates good habits. When we consciously decide what we want to do with the days in our lives, we will typically choose what makes us happy. 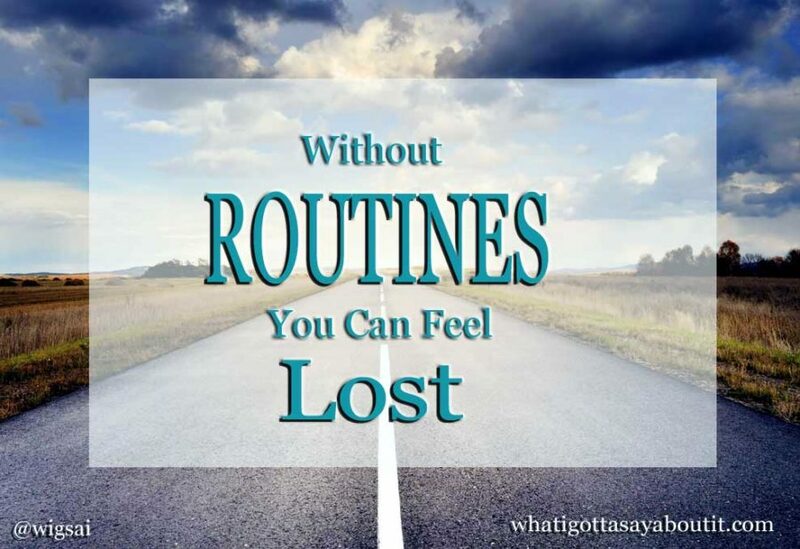 A routine is something that you do over and over again. This eventually becomes a habit. When something is a habit, there is no thought to it. A habit is automatic. If something is automatic it increases efficiency in your life. Why? Well, it allows you to do things without consciously thinking about it. Try to remember when you first started driving a car. At first, you were super conscious about every move you wanted to make. After you’ve driven for a while things became automatic. With a routine, you no longer have to will or motivate yourself to do something. Willpower is finite and motivation is not constant. That is why relying on routine to accomplish tasks is a lot easier than relying on willpower and motivation. At first, you might have to will and motivate yourself to stick to the routine. However, once the routine is set, it is on autopilot and willpower and motivation are no longer needed. When you routinely do something every day, even if it’s just a little, it builds momentum in the long run. You may not realize the benefit of doing several small things every day, but after a while, the payoff can be huge. An example of this is with writing. If you continuously write each and every day, you will become a better writer. If you make it a routine to clean your dish after you use it, instead of just putting it in the sink, you will eliminate the chance of the dishes piling up. It is so quick and easy to clean one dish versus a sink full. After time, this will become automatic. You won’t even have to think about it. You can incorporate other small things like this in your daily routine that will prevent things from piling up. For example, filing paperwork as soon as you’re done with it. Or wiping the stove-top right after cooking. Now, if you can just get your family to join in, this will be wonderful. Produces Respect for Your Time. We often forget just how valuable our time really is. When you get yourself organized by setting up a routine, you really start to respect your time, and what you can do with it. So, there you have it. These are just a couple of reasons why a routine is important. Keep in mind that you have to re-evaluate your routines from time to time. See if you are sticking with them. If not, you might want to make some changes and try again. It can feel a bit overwhelming when you first start putting a routine into place. I know I’m having difficulty trying to build new routines into my life. Apparently, this is because we try to do too much. Try to implement small routines and add on to them when they become a habit. There’s a saying “little by little, a little becomes a lot.” This is definitely true when it comes to building a routine. Do you have a routine? Do you feel lost when you have to operate in a strange environment and cannot do routine things? Feel free to share in the comments section below. We would love to hear what you gotta say.